The latest international venture of Gozo’s Gaulitanus Choir was representing Malta at the 20th edition of the Rencontres Musicales de Méditerranée in Corsica, France, last month, following an invitation from the Jeunesses Musicales de Méditerranée (JMM) of Bastia. En route to Corsica, the choir was in Paris, where it was received at the Maltese Embassy on a courtesy visit to Helga Mizzi, Maltese Ambassador to France. The choir’s first full day in Corsica was spent at Cervione. Its first artistic commitment was at the Collège Philippe Pescetti, where the choir gave two presentations in the afternoon as part of the festival’s educational programme. While Mro Attard presented a background on music-making in Malta to the college students, the choir performed interpretations of various Maltese musical pieces in different genres. After being taken around Cervione, the choir performed at a concert held at the Salle des Fêtes. This was kicked off by the Corsican ensemble A Ricuccata, which presented a varied a cappella repertoire in the Corsican idiom. The Gozitan choir then took to the stage, interpreting several Maltese works ranging from the sacred to the secular and from a cappella to accompanied works. Mro Attard also dedicated an excerpt to the memory of the festival’s late founding president, Guy Dongradi. The next two days were devoted to sightseeing and rehearsing – whether individually or with the festival’s orchestra – for the Rencontres’s concluding gala concert at Bastia’s Theatre Municipal. The Gaulitanus Choir had its own slot in this event, during which it interpreted two semi-folkloristic works. The choir also featured in the grand finale, which brought the festival to a rousing end with the interpretation of Corsica, composed by Georges De Zerbi, who is also the festival’s new president. Corsican singer Mai Pesce was the soloist, accompanied by the festival’s symphonic orchestra, directed by Italian Alessandro Bombonati. 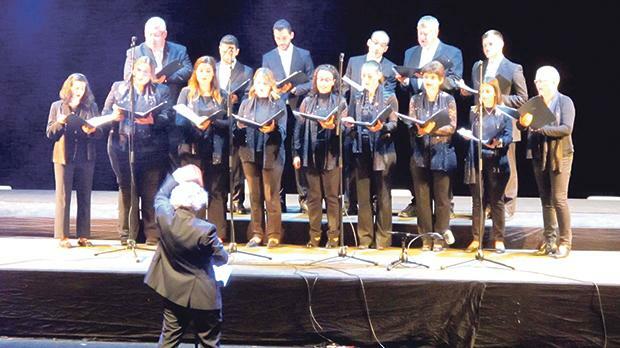 JMM president De Zerbi called Mro Attard on stage to acknowledge his and the choir’s performance and invited them to return to the Rencontres next year. The choir was conducted by Mro Attard and its principal soloist was soprano Annabelle Zammit, with Patricia Buttigieg, Madeleine Gruppetta, Christian Tanti and Jean Noël Attard taking over some minor solo parts. The Gaulitanus Choir was appearing at the Rencontres for the fourth time following three previous successful appearances in 2001, 2002 and 2007. This was the Gaulitanus Choir’s 15th foray abroad and anticipates the choir’s upcoming concert-tour in the UK later this month.